Using Even Flow Savings will show you what you need to pay for this week so you can pay your expenses first. 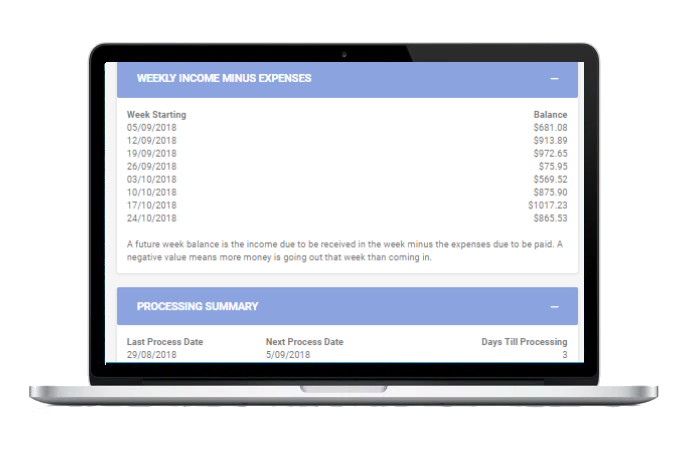 By entering your income and expenses Even Flow Savings will automatically create a budget and determine how much you need to save to keep ahead of your expenditure. An annual gifts expense is created but can be broken down into individual people so you can be remineded when to give the gifts and also how much to spend or have spent. Even Flow Savings will calculate how much you need to have in your savings account to pay for expenses in the future. The team at Even Flow Savings has had over 20 years experience developing software. We believe that we can give our users a hand managing their finances better but simplifying and automating steps and delivering the information they need to make better spending decisions. Our goal is to give our users information conveniently and effeciently when they need it. Once registered use our easy setup wizard to quickly setup your profile, expenses and income.